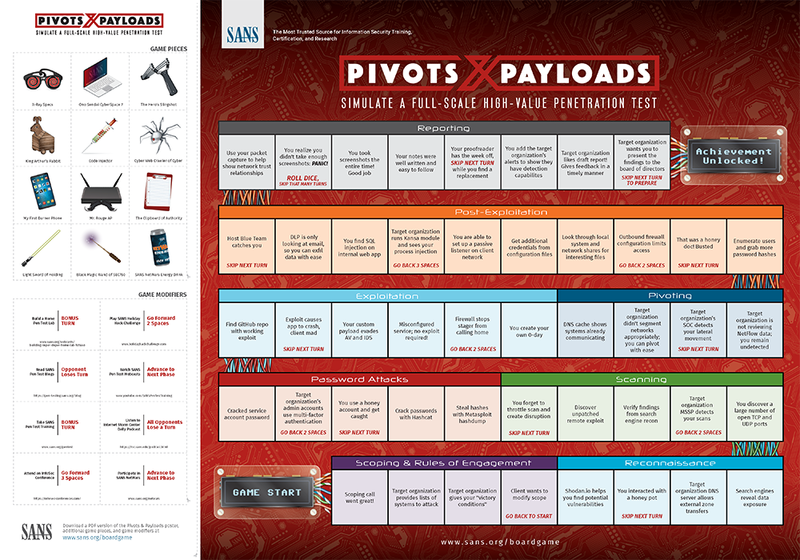 It's a poster and a playable board game called, "Pivots & Payloads," that teaches penetration testing methods and techniques and also shows a few of the processes and procedures Blue Teams can implement to impede the progress of attackers. Join Ed Skoudis, Mick Douglas, and Jason Blanchard for an overview of the new poster/board game. Discover how it was created, why it is useful, and how you can use it to learn about the skills, tools, and techniques of penetration testers. Not only will they give you an overview of the poster/board game, but Ed and Mick will conduct demos on how to use a few techniques found in the game. For an added bonus, we'll tell you more about this year's SANS Holiday Hack Challenge and how you can use this free gift to the industry to build and hone your own penetration testing and InfoSec skills. NOTE: All registered attendees of this webcast, with a valid postal mailing address, will receive (3) printed copies of the brand-new SANS Pen Test Poster: Pivots & Payloads Board Game. The special mailing will take place about one week after the live webcast. BONUS: Play in this year's SANS Holiday Hack Challenge to build and hone your InfoSec skills. The free to play challenge is our gift to the entire InfoSec industry. The game is designed for novice to advanced players. This could be your first CtF challenge or your 100th+ and you'll still learn new skills and have fun while doing it.